for what I chose to do and what I chose to accomplish. Born at Blenheim Palace, England, son of an austere aristocrat, Lord Randolph Churchill. His mother, the daughter of a wealthy New York financier, left his early upbringing to a nanny, Mrs. Elizabeth Everest. Strong in fencing, he became a cadet at the Royal Military College. With Lord Kitchener's army in the Sudan, he took part in the battle at Omdurman and wrote about it as a war correspondent. He was elected as MP for Oldham and in 1910 he was promoted to Home Secretary. There he ran into severe criticism for his handling of gang violence in the fracas of the Sidney Street Siege. During World War I, his management of the disastrous Dardanelles Campaign led to further demotion. He rejoined the army and fought on the Western Front. On the outbreak of World War II King Geroge VI appointed him Prime Minister. His powerful oratory rallied people to the defense of Britain. He published his major history: The Second World War and was awarded the Nobel Prize for Literature in 1953. PETER You didn't have much Latin and Greek. Did you have foreign languages? CHURCHILL Languages other than English did not interest me. English alone, with all of its nuances, can take a lifetime to master. PETER You said in 1936: "There is not one of our (English) rights today, for which better men than we are have not died on the scaffold or the battlefield." Was your view of the martyr forged by the indifference your parents showed you, when you were a child? CHURCHILL if people were not willing to stand up for what they thought was right (which in prior times had led to massacres and martyrdom), their country would not move forward. It was analogous to my pulling myself out of my familial pit of loneliness. PETER From where you are now, do you see the battle field, as necessary for the soul's achievement? CHURCHILL It is not a requirement for humanity that there be wars at this time; it is just that individual souls wish to experience those things. PETER After the collapse of France in 1940, you said, "Let us therefore brace ourselves to our duties, that if the British Empire last for a thousand years, men will still say, "This was their finest hour." How do you view the Brtish Empire now? 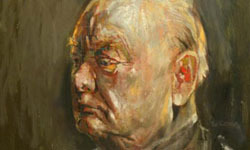 CHURCHILL Its fascination with the royal family has not changed, and probably never will. It is almost as if the royal family are well groomed, well paid-for pets of the people. PETER "I feel that Christian men should not close the door upon any hope of finding a new foundation for the life of the self-tormented human race." You wrote those words in 1950. CHURCHILL The new foundation is what your Spiritualists or your New Age people - whatever you want to call them - call "discovering your souls," discovering the love that is within them, discovering their connection to the Creator. Toni comments: Ever the orator, Winston was proud to share his views with all. At times he sounded bombastic as a no-nonsense, make-no-excuses politician, whom I could see waving the Union Jack. I sensed he had enjoyed his human experience immensely, and that he still advocated people should live and play heartily. Peter comments: It is interesting to witness the dichotomy that spirits can experience on returning Home from planet Earth. On one hand they are in an unconditionally loving, non-judgmental atmosphere, where they no longer have regrets; on the other hand they are able to dive emotionally right back into their former personality. The way forward is in discovering our connection with love and with the Creator. Most people will not be mature enough to make this connection. There is an energetic crisis on planet Earth that is soon to reach its dénouement. The role of the prophet will become important in the coming years. If you would like to read or listen to more about Churchill, here are some recommended books by him, a biography and a CD of his famous speeches. Learn more from Amazon Uk by clicking on the images - as well as on Celestial Voices above. Also watch out for a new Radio 4 play by Jonathan Smith, one of Radio's leading dramatists. It's about the Churchill/Sutherland portrait saga of 1954.